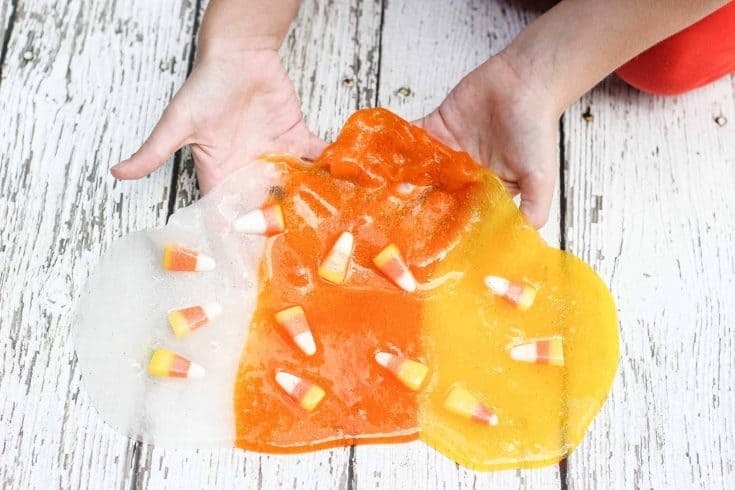 It actually felt like fall here for about 10 minutes this morning so it’s the perfect time to make Candy Corn Slime! It will help us pretend it’s fall when lunchtime rolls around and it’s summer again. The black cat is optional, but he does adds a little magic to the recipe. 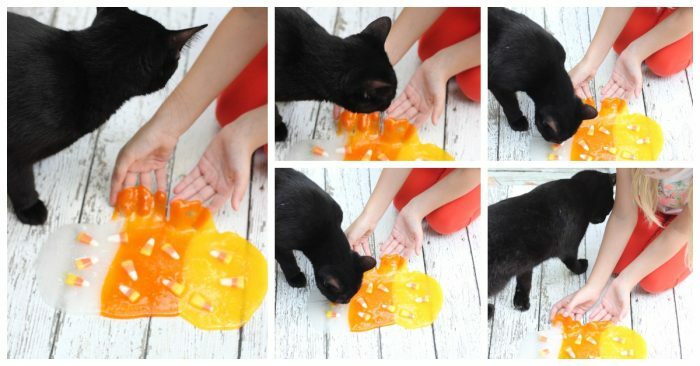 Make a large batch of my basic Halloween slime recipe with clear glue. You’ll want enough to divide into thirds and tint one part yellow, one part orange, and leave the other clear. I like to use gel food coloring for bolder, brighter colors that won’t affect the consistency of the slime. Just like when baking a cake! Add glitter to each slime section. We did white glitter for the clear and yellow and orange for the other two sections. 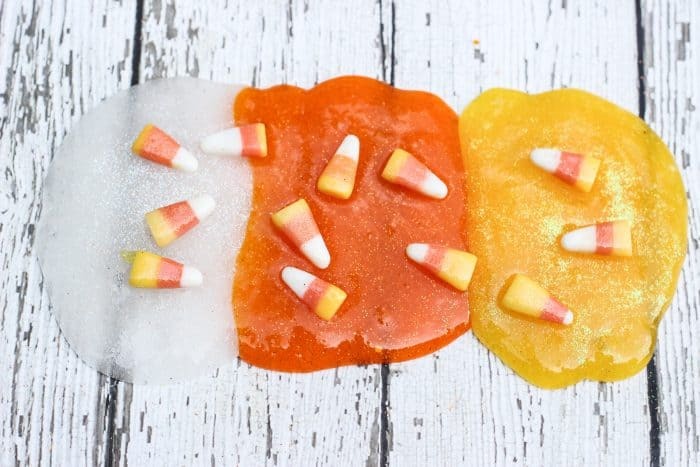 Mix in your faux candy corn and enjoy! We liked to play with the colors separately for a little while, then I laid them all out beside one another to resemble a candy corn. After you’ve played a while and mixed all three colors together, it takes on a light orange color that’s perfect for fall. Clear School Glue - Again, you'll want the gallon size. Trust me. Liquid Starch - Found in the laundry aisle at local stores or on Amazon. At this point, it's best to get hands-on by taking the slime out of the bowl and working it with your hands.If the slime is too sticky, add more starch. If the slime is too goopy/stringy, add more glue. Once you have the perfect consistency, add the candy corns. Check out our other Halloween slimes too!